Climate: The sum total of weather conditions and variations over a large area for a long period of time (more than thirty years) is called climate. Weather: The state of the atmosphere over an area at any point of time is called weather. Monsoon: This type of climate is mainly found in the south and Southeast Asia. The climate of India is of monsoon type. The seasonal reversal in wind direction during a year is called monsoon. Coriolis Force: An apparent force caused by the earth’s rotation is called Coriolis Force. The winds are deflected towards right in the northern hemisphere and towards the left in the southern hemisphere due to this force. This is also known as ‘Ferrel’s Law’. Western Cyclonic Disturbance: The western cyclonic disturbances are weather phenomena of the winter months brought in by the westerly flow from the Mediterranean region. They usually influence the weather of the north and north-western regions of India. Inter Tropical Convergence Zone (ITCZ): The Inter Tropical Convergence Zone (ITCZ,) is a broad trough of low pressure in equatorial latitudes. The northeast and the southeast trade winds converge in this zone. This zone lies more or less parallel to the equator. It moves north or south with the apparent movement of the sun. Latitude: The Indian landmass is equally divided by The Tropic of Cancer. Hence, half of India has tropical climate and another half has subtropical climate. Altitude: While the average elevation in the coastal areas is about 30 metre, the average elevation in the north is about 6,000 metre. The Himalayas prevent the cold winds from Central Asia from entering the Indian subcontinent. Due to this, the subcontinent gets comparatively milder winters as compared to Central Asia. Pressure and Winds: The Indian subcontinent lies in the region of north-easterly winds. These winds originate from the subtropical high-pressure belt of the northern hemisphere. After that, these winds blow towards south. They get deflected to the right due to the Coriolis force and then move towards the low pressure area near the equator. The north-easterly winds originate and blow over the land and hence they carry very little moisture. India should have been an arid land because of these winds but that is not the case. There is high-pressure area towards the north of the Himalayas. Cold winds from this region blow to the low pressure areas over the oceans in the south. During summer, low-pressure area develops over interior Asia and also over northwestern India. This results in a complete reversal of the direction of winds during summer. Air; from the high-pressure area moves over the southern Indian Ocean in a south-easterly direction. It crosses the equator and turns right towards the low-pressure areas over the Indian subcontinent. These winds are known as the Southwest Monsoon wind. They collect moisture from the warm oceans and bring widespread rainfall over the mainland of India. The upper air circulation in this region is dominated by a westerly flow. 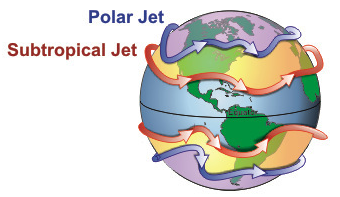 Jet stream is an important component of this flow. These jet streams are called subtropical westerly jet streams because they are located approximately over 27°-30° north latitude. The westerly jet streams are responsible for western cyclonic disturbances in the north and north-western parts of India. The subtropical westerly jet stream moves north of the Himalayas with the apparent movement of the sun. The tropical jet stream (an easterly jet stream) blows over the Indian Peninsula; approximately over 14° north during the summer months.